Product prices and availability are accurate as of 2019-04-21 10:22:25 UTC and are subject to change. Any price and availability information displayed on http://www.amazon.com/ at the time of purchase will apply to the purchase of this product. Western Apparel at its best. Detailed western engraving on Solid Metal Belt Buckle and Conchos. A Longhorn Steer Bull Head buckle with matching Bull head Star conchos. Measure around where you wear the belt and order the size closest to it. Real leather hand-woven into an x pattern. State of Texas engraved on the Star conchos. 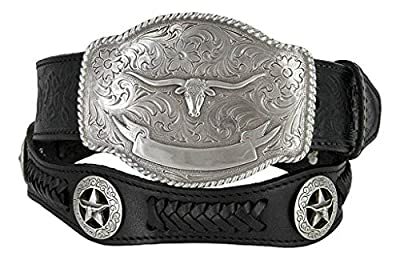 Western pattern embossed on genuine cowhide leather Sterling Silver-Plate Hook-Back Solid Metal Trophy Buckle is removable 1-1/2" Wide with our easy Snap System to Interchange your favorite Western Buckles.